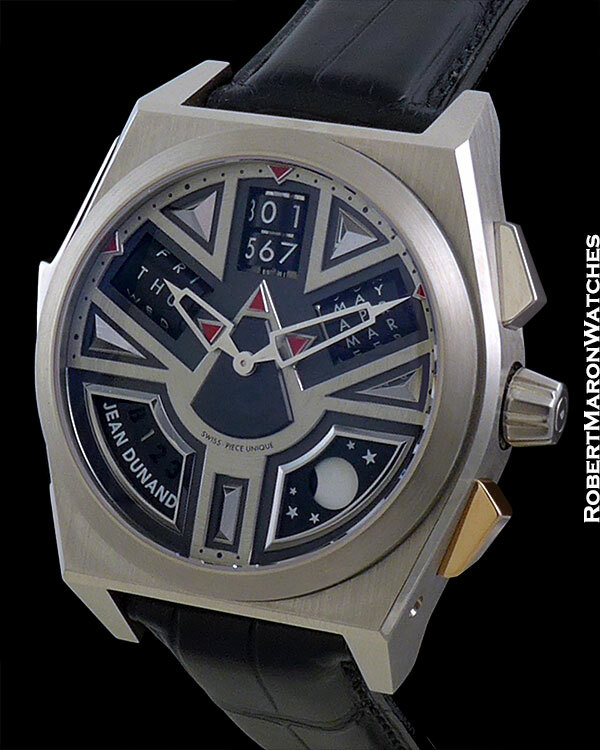 Behemoth is the word that comes to mind when looking at this Jean Dunand Shabaka wristwatch. This watch is huge both literally and figuratively/horologically. Jean Dunand was launched in 2003 by partners Thierry Oulevay and Christophe Claret. The former, sadly, passed away in 2013 (his signature is on the certificate that accompanies this watch). 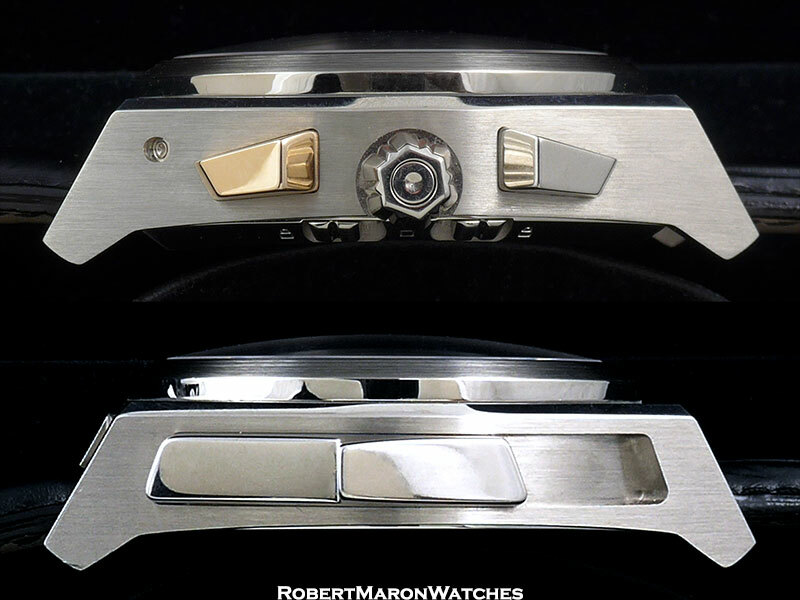 Mr. Claret is known as the best complicated caliber designer in the industry and quietly designed some of the most complicated movements used by the leading/elite Swiss brands for decades. 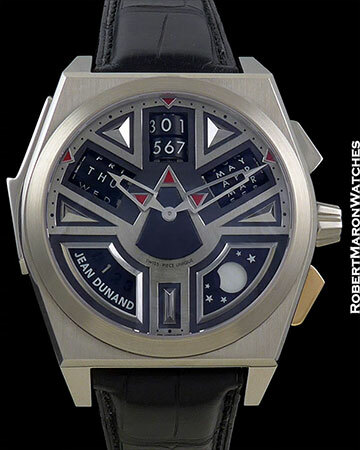 All Jean Dunand watches feature a Christophe Claret caliber. The Shabaka model debuted in 2007, named after a twenty-fifth dynasty pharaoh of Egypt. The Shabaka dial is custom made, and made only once, so each Shabaka watch is a piece unique. This prestigious designation appears on the case back. 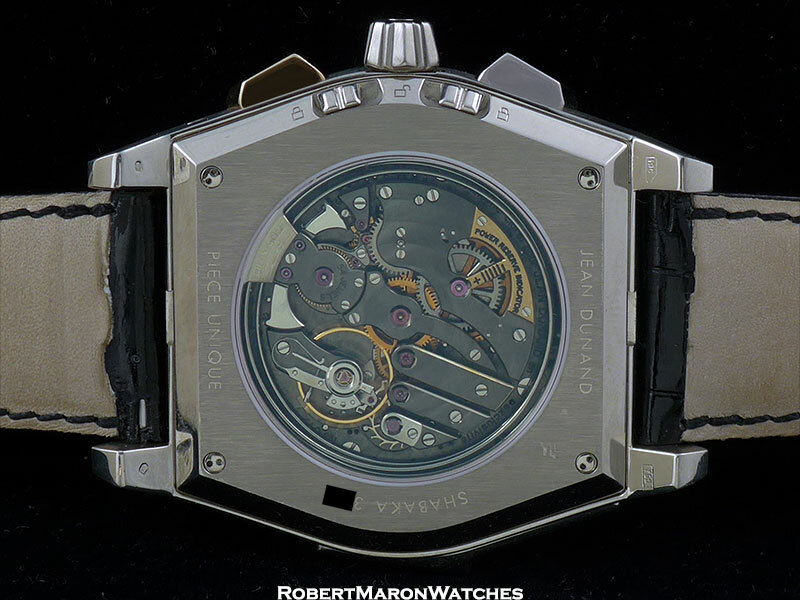 The technical aspects of this watch are dazzling. At the heart of the watch, design wise, are the four rotating cylinders that display the calendar information. Each has its own “transmission system” to ensure that it changes instantly and precisely on time. You can hear the cylinders snap into position when the hands hit midnight. Case is 18k white gold with an angular modern tonneau shape, which alternates between brush and mirror finished surfaces. Dimensions are 57mm long x 44mm wide x 17.5mm thick. Sapphire crystals front and display back. The minute repeater activation slide is on the 9 o’clock case side. The two buttons on either side of the crown are not chronograph pushers, as they appear to be, but rather quick-setting buttons for the calendar functions. Ingeniously, each button has an adjacent slide on the case back to lock/unlock the button. The dial on this watch is very far away from a conventional dial, meaning it’s an original design and very eye catching. The cylindrical calendar displays instantly draw one’s attention, and each has a red arrow pointing toward the display on both sides. The dial is divided into ten sectors, alternating between functional calendar apertures/displays and ornamental geometrical shapes. On display are: Day, Date, Month, Moonphase and Leap Year. Hands are proprietary Skyscraper style and are 18k white gold. As incredibly nice looking as this watch is, it is easy to forget that is also offers Minute Repeater with Cathedral Gongs, which is Mr. Claret’s favorite complication. Of course, the tone is magnificent. The Cathedral Gongs wrap around the perimeter of the movement twice, for more resonance and tone. The hammers are visible working through the display back. This movement is signed “Christophe Claret” and has 721 individual parts, 54 jewels, a power reserve of approximately 45 hours, swan’s neck balance adjustor, and beats at 18,000 beats per hour. This Piece Unique is really a masterpiece of a wristwatch. Watch is in new condition with box, owner’s manual, certificate of original and warranty and even a white glove. US Retail price is $589,000.